With over 100,000 restaurants and bars to choose from, picking where to eat and drink in Tokyo is a deliciously overwhelming challenge! You and your private group of, at most, 8 people, can go on this evening tour that takes you drinking and snacking with a local English-speaking guide through Shinjuku, Tokyo’s entertainment town. 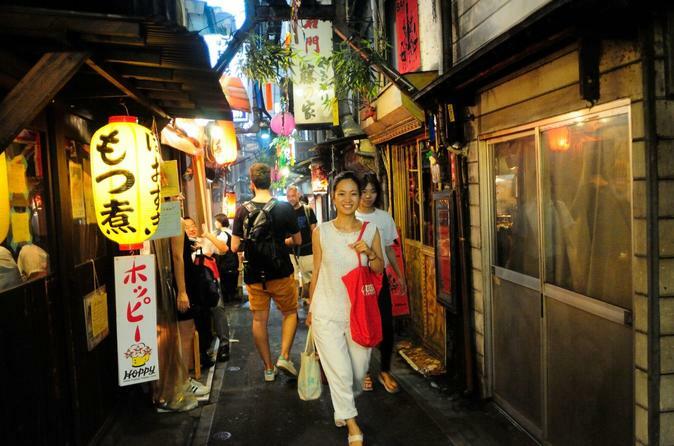 Two drinks are included in the price of this walking tour, along with various skewered snacks as you explore Omoide Yokocho, Kabukicho, and Golden Gai. Shinjuku, Tokyo’s entertainment town, is where locals go to grab a bite and a drink after dark, and you'll be joining them on this drink tour that’ll introduce you to local nightlife. The evening will kick off at a Japanese izakaya-style eatery for happy hour. As is a favourite pastime for many Japanese, you’ll start the night off spending some leisurely time chatting with your fellow tourmates over drinks and snacks. Once you’re warmed up, you’ll meander through Omoide Yokocho, a collection of alleyways full of tiny bars and eateries. Get a peek at the different types of food joints the locals usually eat at, from yakitori restaurants and soba shops to cafes and bars. Should you like to come visit again on your own time, Omoide Yokocho can be a great place to sit and eat elbow-to-elbow with the businessmen and see how they unwind after working hours. The tour takes the group onward to Kabukicho, an area full to the brim with over 3,000 shops, restaurants, nightclubs, karaoke and the like. Awash in bright neon lights, Kabukicho is one of Tokyo’s most photogenic areas. With streets filled with people and music blaring from every corner, you’re sure never to have a boring evening in Kabukicho! The evening will end in Golden Gai, a compact neighbourhood full of tiny bars that can usually only seat six to eight people at a time. It is here in Shinjuku’s most popular drinking spot where you’ll pop into one of your guide’s favorite bars and say kanpai (cheers!) over more drinks. From here, your guide can either give you directions back to your hotel or next destination, or leave you chatting through the night with new friends.